You wouldn’t wear the same shoes for hiking trails, walking on slippery rocks, in the sand, in the mud, in a boat, standing all day in the hot sun, or in water barely above freezing. But that’s exactly what anglers want from wading boots, and we want them to be comfortable as well. Anglers demand a lot from wading boots. A lot more than we do other shoes. The best wading boots will perform in a wide variety of conditions, but how can you know which pair will fit your needs and your feet? That’s why Fly Fishing Atlas brings you our review of the best wading boots. Which pair of wading boots will perform the best for you is going to depend on your fishing needs and conditions. Whether you are looking for the very best wading boots for fly fishing or affordable wading boots that can perform, this review covers them all. We are big fans of rugged fishing gear that doesn’t break the bank. We want you to find the best wading boots for your needs. Fishing gear can be pricey, but you might be surprised that a good pair of wading boots doesn’t need to be expensive. Durability – Even inexpensive wading boots can last you a few years if you find the right pair. But if you love to fish, and you fish a lot, then you’ll need to consider how you intend to do the majority of your wading. A solid set of wading boots needs to fit you comfortably and perform in a variety of applications. Otherwise you’ll be looking for another pair before you know it. Proper Fit – Trout fishing and cold water go hand-in-hand. When the fish are smashing streamers or rising for dry flies the last thing you want is to have your day cut short because your feet are uncomfortable. Keeping your feet warm in cold water is dependent on maintaining good circulation. Cold water fishing can be especially taxing if you have boots that fit too tightly. The stocking foot on your waders will take up some space in your wading boots. But you also want some additional room for warm socks. And even with additional socks, you’ll want to be sure your boots provide enough extra room to avoid compressing your feet. Good Grip – We recommend rubber soled wading boots. Felt soled boots provide excellent grip on really slick rocks, but they provide terrible grip on most other surfaces. More than one angler has punctured their waders because they slipped on dry pine needles or a muddy hillside. Most manufacturers produce stud-compatible rubber soles which gives a distinct advantage to rubber soled boots in and out of the water. If you are doing even a little hike-in fishing, rubber soles make much more sense. Rubber soles can save you from damaging your expensive gear, or worse. Unwelcome Hitchikers – The other reason we recommend rubber soled boots is due to invasive species. Invasive plant life like didymosphenia geminata destroys entire trout streams and hides within the tiny cavities of felt soled boots. In fact, some states have banned felt soled boots completely in an attempt to stop the spread of invasives. With that in mind, rubber soled boots may allow you to fish more water that might be off-limits by purchasing felt soled boots. However, there are some wading conditions where felt soles provide unmatched traction. Korkers Greenbacks exchangeable soles give you options you won’t find in other boots. Like other Korkers wading boots, Korkers Greenbacks provide you with the great option to swap between rubber or felt soles on the fly. The OmniTrax 3.0 sole system boasts a number of sole options in addition to rubber and felt. Korkers also offers studded felt, studded Vibram soles, and their Triple Threat sole can be fitted with studs, aluminum hex discs, or even full width aluminum bars. The upper is made from durable synthetics that stand up very well to rough wading and abrasive rocks. The synthetics also prevent water absorption which reduces weight and allows for faster drying. Korkers also reduced weight by adding internal channels within the boot to allow faster drainage. For the best fit Korkers recommends ordering a full shoe size larger than your normal footwear. The online reputation of Korkers Greenbacks is quite impressive, with 94% of the reviewers giving them a 4 or 5 star rating. Reviews are stocked with compliments like, “very good design,” “changing soles was a nice feature and easy,” and “comfort is top notch.” That’s exactly what you are looking for in a wading boot. The ability to swap soles is really like having multiple pairs of boots, which can save you some serious coin. And if you want to be extra sure you aren’t carrying invasive species, the removable soles allow you to bleach the felt soles separately from the boots. With the ingenious design and great price of Korkers Greenbacks, we don’t hesitate to recommend them. Redington Skagit Boots are available with rubber or felt soles. Redington’s Skagit River wading boot is a great choice if you need a rugged wading boot with a reasonable price. The Skagit wading boot is available in both sticky rubber or felt soles. The rubber soles are very grippy on their own, but they are also stud compatible if you want additional gripping power. Skagit wading boots also feature a reinforced toe and heel for support and protection. And for extra protection and rugged abrasion resistance, Redington wrapped the Skagit boots with a high-sided rubber rand. One of the features that you usually won’t find in wading boots in this price range is good ankle support. Thankfully Redington designed the Skagit to provide good, rigid ankle support to protect your ankles from twisting when your wading in bigger rocks. And the ankle and collar features ample padding for additional protection and support. The upper features mesh panels to facilitate faster drainage. And the quick-draw lacing and speed loops are made with anti-corrosive metals. 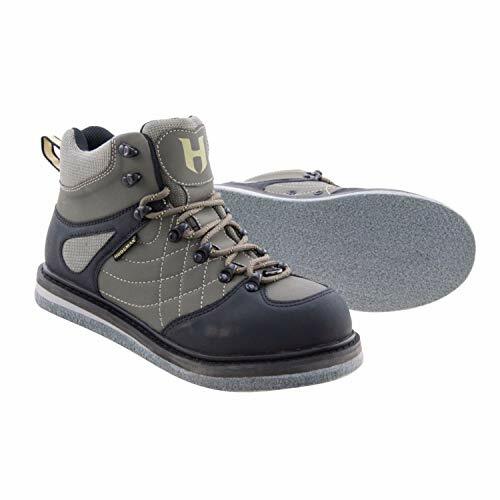 Reviewers online leave positive comments like “Very stable boot,” “Well constructed, and comfortable,” and “5 star product.” Anglers recommend ordering a full shoe size larger than your normal footwear, particularly if you winter wade and use warm socks. Overall, 80% of reviewers rate Redington Skagit wading boots with 4 or 5 stars. We prefer rubber soles, and Redington recommends Goat Head Spikes if you want to add extra grip to the sticky rubber sole. Sometimes that extra grip can really save you an headache in slippery conditions. The Redington Skagit River Wading Boots are a durable and comfortable choice if you are in the market for affordable wading boots. Fishing gear from Simms is just all around quality, and G3 Guide wading boots carry on the trend. G3 Guide wading boots from Simms have been tremendously successful and have built a stellar reputation with die-hard anglers. Simms has constantly improved their design by updating their G3 Guide wading boots. The most recent update has seen a number of smart improvements to the Simms G3 Guide Boots. The upper of the G3 Guide Boot is made from water-repellent full grain Nubuck leather that provides flexibility and rugged foot protection. And the newest iteration of this wading boot has brought improved sensation so you have better confidence in your foot placement and traction. Simms also divided the ESS retention plates, located within the sole, into multiple separate sections. This gives the G3 Guide Rivertread Sole a greater range of flexibility while still providing for excellent stud anchoring. The Rivertread Sole holds traction on slippery surfaces very well and allows for a greater range of capability both in and out of the water. A full scratch rubber rand provides you with extreme abrasion resistance and durability. You really get the sense that you can depend on the G3 Guide wading boot to protect your foot. The internal neoprene lining has also been extended all the way around the ankle and down into the boot. That feature has really added a lot of warmth in cold water wading. The neoprene also provides additional impact protection and support around your ankles. Simms recommends sizing up a full shoe size for men and down a full size for women. A pair of Simms G3 Guide wading boots will last you many years. The top-tier construction and fair price make Simms G3 Guide wading boots worthy of consideration if you are in the market for wading boots. Today’s wading boots for women are both stylish and functional. The days of all fishing gear sporting brown, green, and black colors are gone. Fishing gear manufacturers realize that women want fly fishing gear that doesn’t fit like men’s gear. The colors have changed. The fit has changed. And women are hitting the water with gear that that looks sleek and that can really perform. Fishing gear used to be designed just for men. That’s definitely not the case anymore. If you are looking for a wading boot that meets at the perfect crossroads of style and performance, then Patagonia Ultralight wading boots are sure to impress. With great traction and support, these wading boots were designed specifically with women in mind. Long days hiking the river banks and catching trout requires a durable boot that won’t bring a whole lot of extra weight along. These ultralight women’s wading boots from Patagonia are the answer. The sticky rubber soles are perfect for gripping onto slick river bottoms while also being stud compatible when desired. The molded EVA midsole provides comfort and cushioning when you are working that really productive pool. A synthetic leather upper with mesh drainage takes the ultralight nature of these women’s wading boots to the next level. You can tire yourself out from intense fishing rather than carrying extra weight. Patagonia Ultralight wading boots are a really smart design that will last through many years of hard fishing. Patagonia really focused on the small details, like a heel designed for fin straps, and a protective toe box that won’t collapse from water pressure. For any female anglers looking for a functional and great looking pair of wading boots, we highly recommend Patagonia Ultralight wading boots. The ability to change soles on the Buckskin Mary wading boots from Korkers can save you some cash. Korkers Buckskin Mary wading boots offer more than just contemporary looks. They’re also comfortable and capable for serious women anglers. 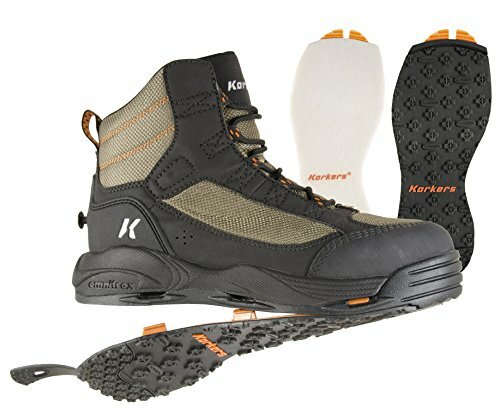 Korkers boots come standard with the OmniTrax 3.0 sole system which allows you to swap soles when needed. In addition to rubber and felt, Korkers offers studded felt, studded Vibram soles, and their Triple Threat sole can be fitted with studs, aluminum hex discs, or full width aluminum bars. And the rubber toe cap and side panels increase durability. The non corrosive lacing hardware and heel lock provide a secure fit that reduces heel lift while walking. Korkers is really smart about incorporating hydrophobic materials into their design to prevent the spread of invasive species. Another benefit of the use of synthetic materials is faster dry times. Korkers doesn’t insulate their boots as heavily as some other manufacturers do, which is no big deal. You’ll just want some extra room for warm socks while cold water wading. Since Korkers recommends sizing up one whole size larger than your normal shoe size, you may want to consider a full size and a half if you fish a lot of cold water. Its definitely better to have a boot that fits you a little big on occasion rather than have super cold and uncomfortable feet. We really like that Korkers boots have the ability to swap soles. That feature alone can save you some cash because it is really like having multiple pairs of boots. And the removable soles provide the ability to really clean your felt thoroughly to fend off invasive species. With a fashionable look, innovative design, and great price, we gladly give Korkers Buckskin Mary wading boots our stamp of approval. Redington Willow River wading boots have a smart and polished look. The Willow has a sharp look and offers a huge value in a tremendously capable boot. Redington offers the Willow in both sticky rubber or felt soles and their rubber soles are very grippy. But they are also stud compatible if you know you are going to face particularly slippery surfaces. Redington wrapped the Willow boots with a high-sided rubber rand for rugged abrasion resistance and additional protection. 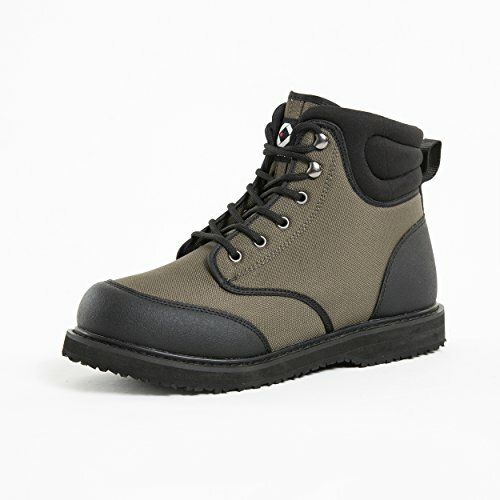 Willow wading boots also feature a reinforced toe and heel for support and protection. 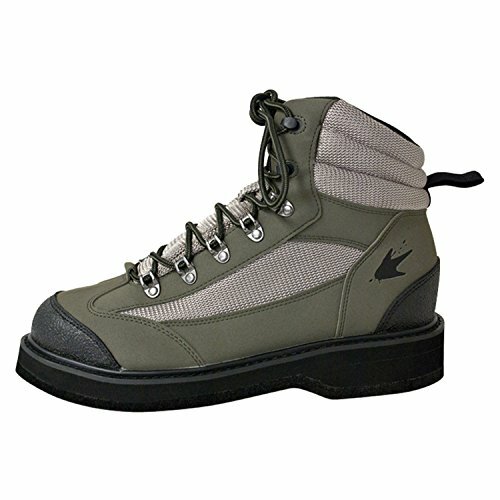 The Willow wading boots offer a lot of comfort compared to other boots in this price range. Redington designed the Willow with a padded collar around the ankle to protect your ankles from bumps and scrapes. The upper also has good rigidity to support your ankle reduce the chance of twisted ankles. The lacing system features speed loops and deep-draw lacing with anti-corrosive metal hardware. The upper panels are made from synthetic mesh to facilitate fast drainage. Online reviewers put their stamp of approval on the Redington Willow with 94% of the comments leaving 4 or 5 star reviews. Compliments include, “supported my feet and ankles beautifully“, “Very comfortable and amazing quality,” and “Love these boots! !” Women also comment that they recommend purchasing a size or even a size and a half larger than your normal shoe size. If you fish cold water for steelhead or salmon during the spring melt then you really need that extra room for warm socks. We recommend rubber soles whenever possible, and for extra grip Redington recommends Goat Head Spikes. That extra grip can save you from ripped waders or even a broken rod in slippery conditions. We don’t hesitate to recommend the Redington Willow River Wading Boots as a fashionable and comfortable option that comes in at a terrific price. Kids love to catch fish just like mom and dad. And they love to see fish rising for dry flies, just like mom and dad. Panfish like bluegills and sunfish take flies on the surface with little hesitation. If you want to get your kids hooked on fly fishing its important to start them with the best chances at success. And when your kids are ready to start wading right along your side, its important to start them with gear that helps them focus on enjoying themselves. Kids really need boots that provide them with a solid foundation and grip so they aren’t falling and slipping. Equally as important is finding boots that contribute to their overall comfort. If you want your kids to enjoy fishing and keep coming back for more, then comfortable gear needs to be a priority. The Crosswater boots from Redington are hands down the best youth wading boots. Young anglers need to be comfortable on the water so they can enjoy themselves and hopefully reel in a lot of fish. Redington produced the Crosswater Wading Boot specifically with the comfort of young anglers in mind. The upper is stitched from a high denier rugged nylon to withstand the scrapes and abrasion that goes hand in hand with kids wading. And the high coverage rubber rand wraps the boot with a layer of durability that is ready to take on the harshest conditions. We really like that the Crosswater has a neoprene lined collar and that the interior is neoprene lined as well. That adds a huge comfort factor to these wading boots. The deep-draw lacing also helps to hold your child’s foot securely. The great lacing system and speed loops help to prevent heel lift and discomfort from friction or blisters. Like all boots in the Redington line, Crosswater wading boots feature a sticky rubber sole that is also stud compatible. Even though these boots provide excellent grip, we highly recommend the addition of studs with youth wading boots. It is really worth while to give your kids that extra level of traction to avoid trips and falls that might cause water to accidentally enter their waders. The beneficial and comfortable designs combined with an attractive price make the Crosswaters from Redington our choice for best youth wading boots. Water flows thru internal channels then out midsole ports, removing excess water and weight.